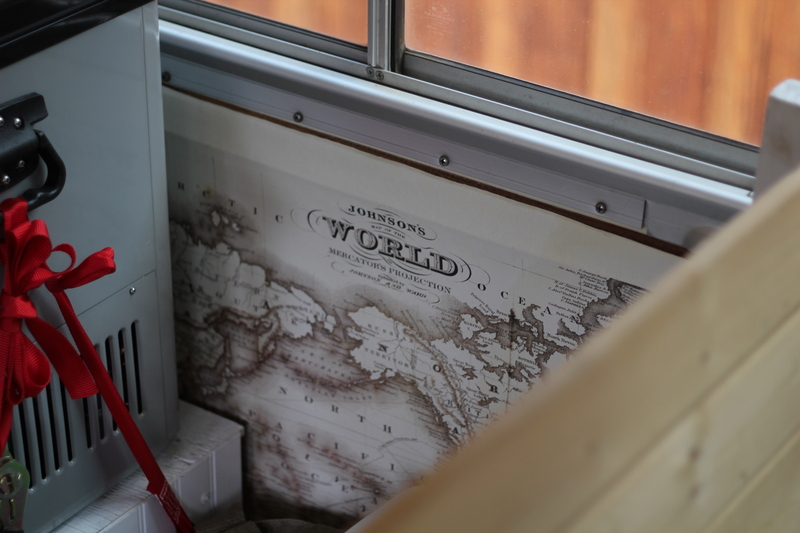 To help answer some questions we have been getting we decided it was time to take you on a little tour of our bus interior. I hope the photos show enough detail, feel free to post a comment if you have more questions. 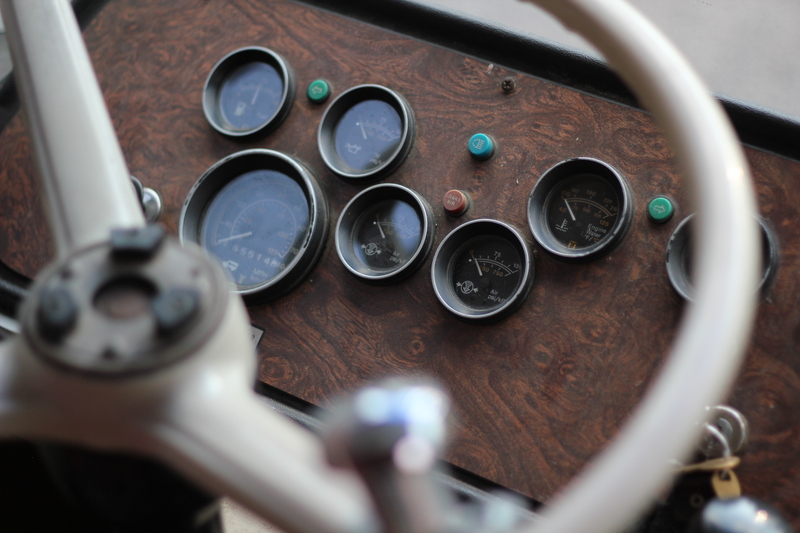 We start up front with the captains chair and giant steering wheel. The air ride seat is fairly comfortable, and having the little fan actually helps quite a bit. 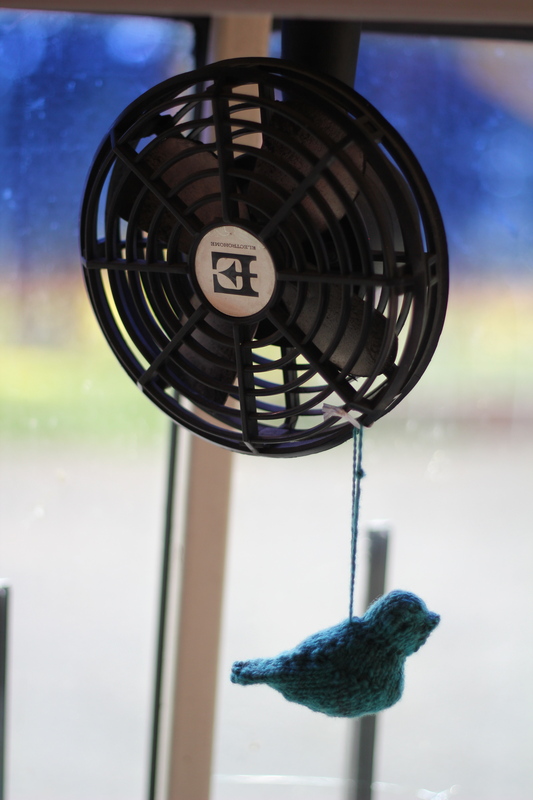 The little handmade Bluebird is a gift from our friends in Michigan. All the gauges work except the speedometer, but I have gotten pretty good at judging our speed from the sound of the engine. 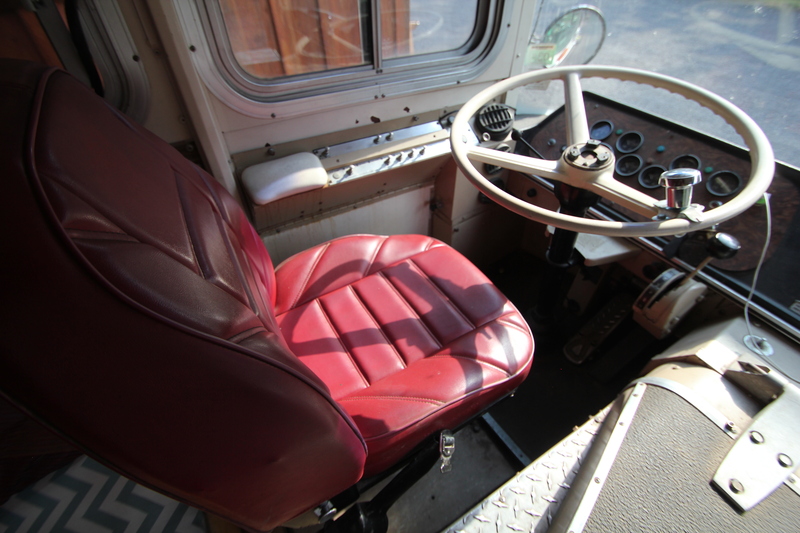 Sitting right next to the engine is hot and loud, having a rear engine bus would sure be more comfortable! 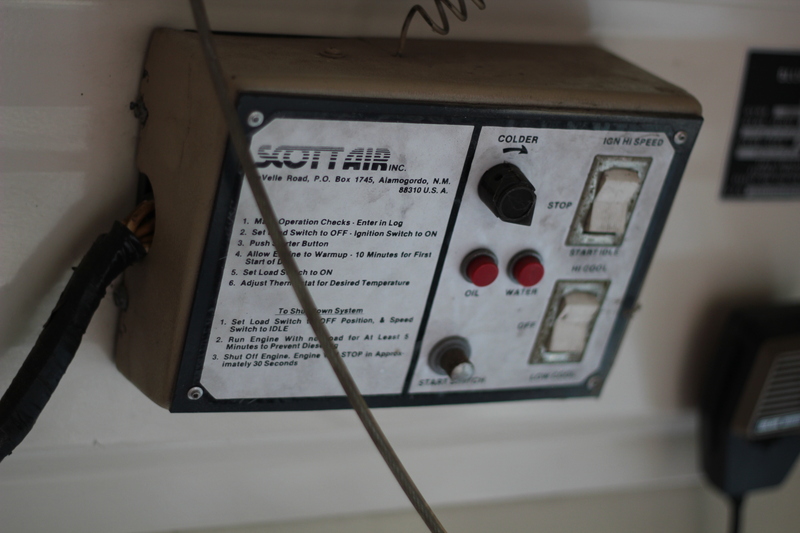 There is also a control panel for the old Scott Air AC setup, which is powered by a 17HP Yanmar 3 cylinder diesel. I still haven’t figured out what to do with that yet. 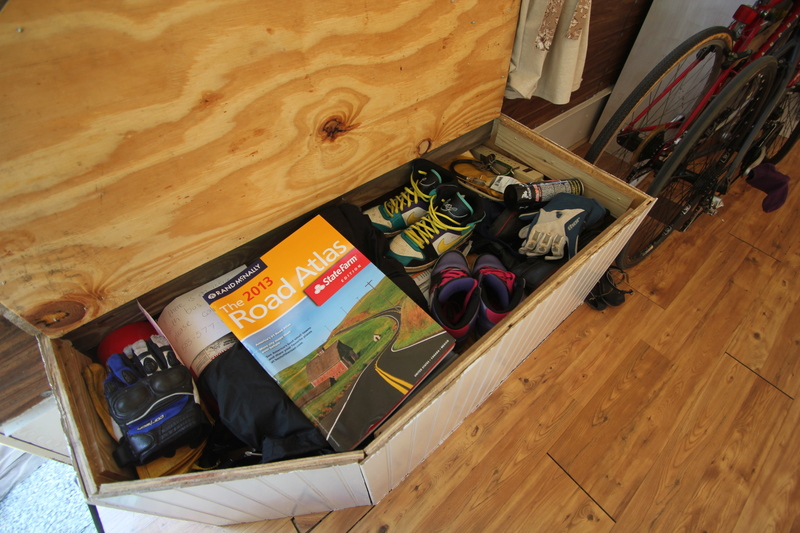 Next up is the box next to the front door. 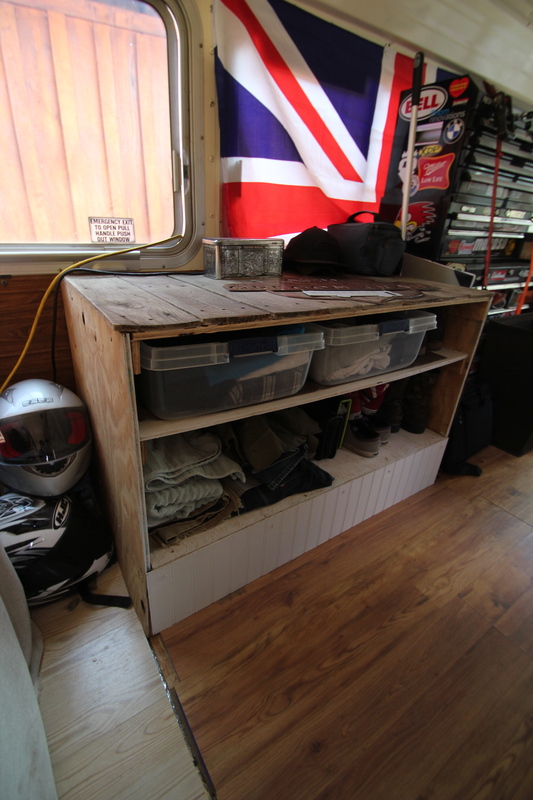 This was built over the wheel well as a storage area for shoes and spare parts and tools. 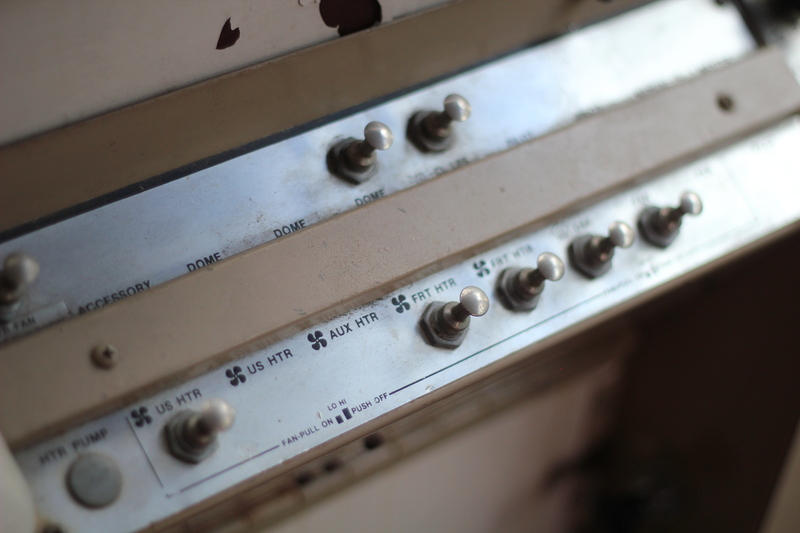 It also allows quick access to two fire extinguishers. 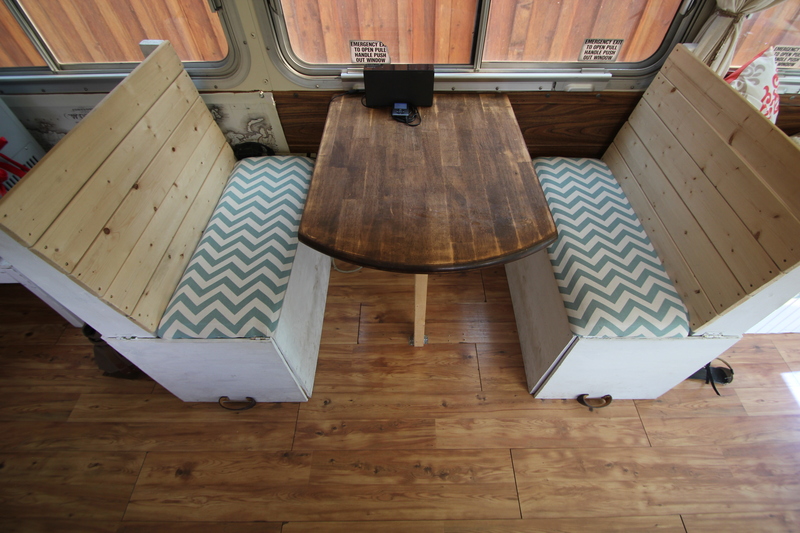 Across the isle there is a small bench built over the other wheel well, this is the only passenger seat available (besides the dinette). 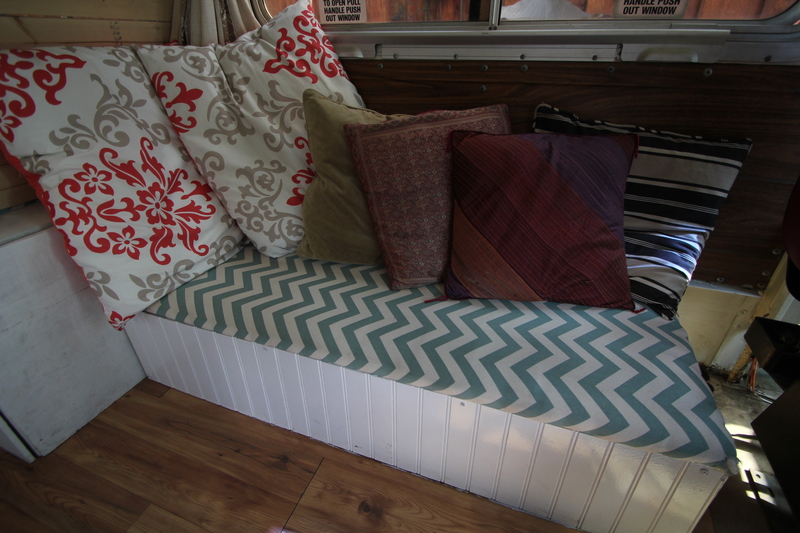 Moving back we have the dinette, each bench has a small storage area underneath. The table was an old kitchen table we got for free. It was pretty beat up and didn’t look very nice, but after removing the side wings and some strategic sanding and staining it works out well and is very comfy to sit at. 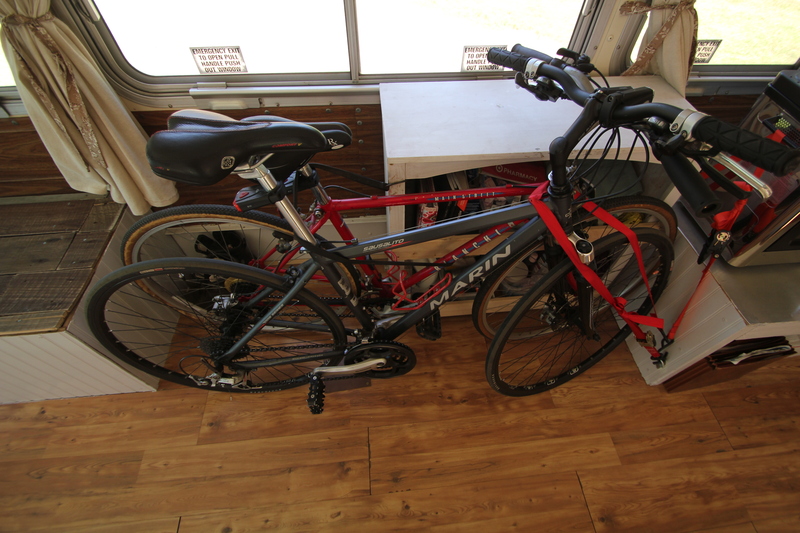 On the other side is a little bookshelf we installed to hold various supplies, and our secure bike storage area. Ratchet straps sure are useful! 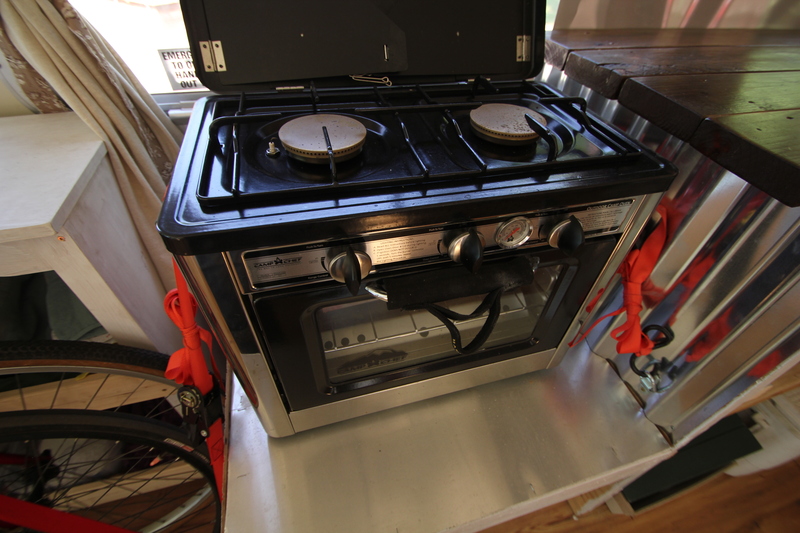 We built a very simple but effective kitchen area, using a small Camp Chef propane camping stove/oven, a portable Edge Star fridge/freezer, and a foot pump sink. 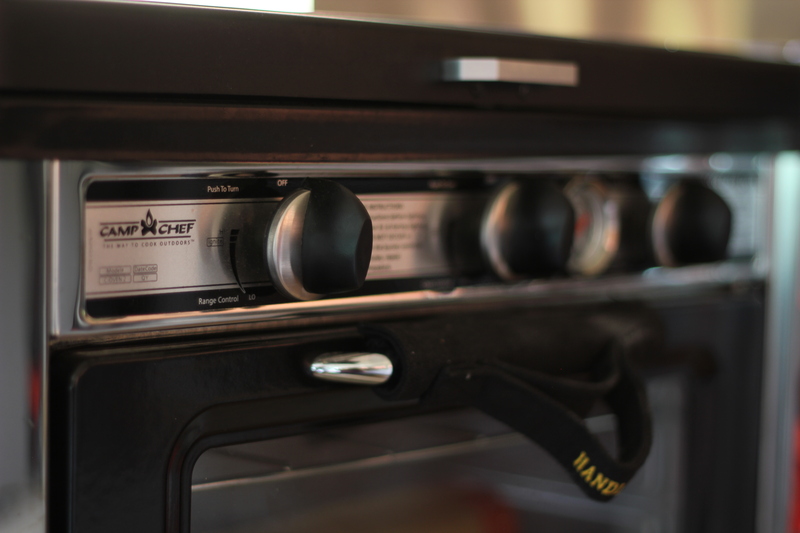 The stove is nice to use, and the oven works surprisingly well. Lindsey has successfully made many delicious biscuits and even a berry cobbler. We also made some amazing bus pizza while we were camping in Michigan. 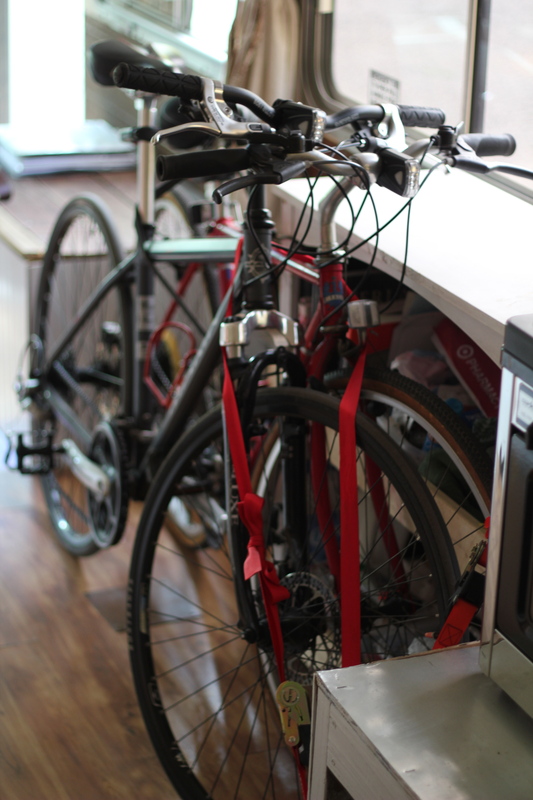 The little fridge works great, we are very happy with it. 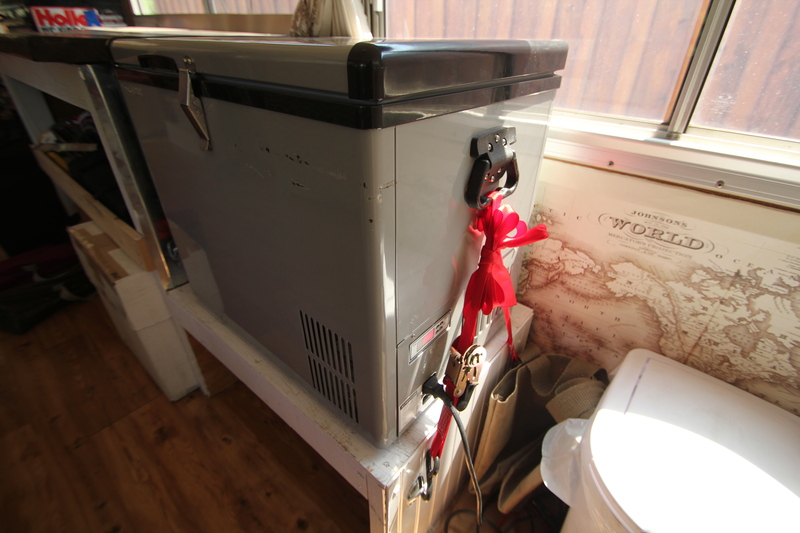 We have plans to add a small chest freezer converted into a fridge so we have some more food storage space. Our sink is run by a foot pump and two jerry cans, one for the drain and one for fresh water. The setup is very easy to use, and really teaches us about water conservation! 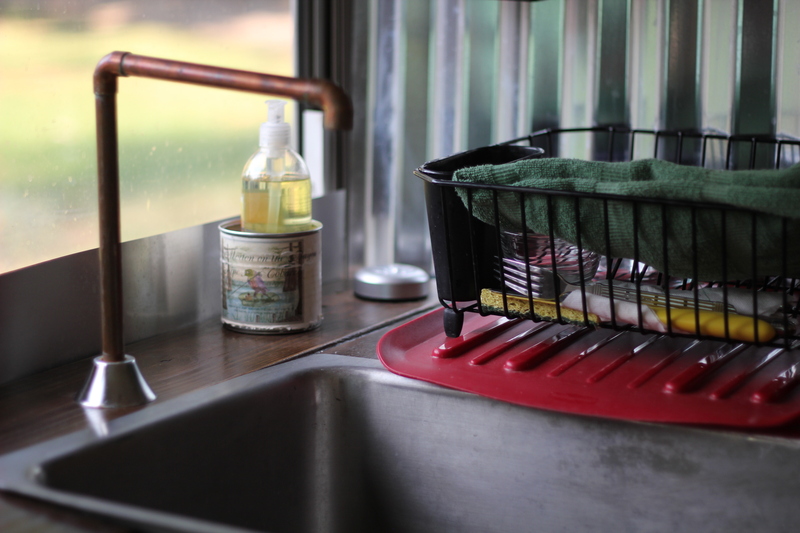 When we are cooking and eating in the bus regularly we have to empty the grey water and refill the fresh at least once a day. 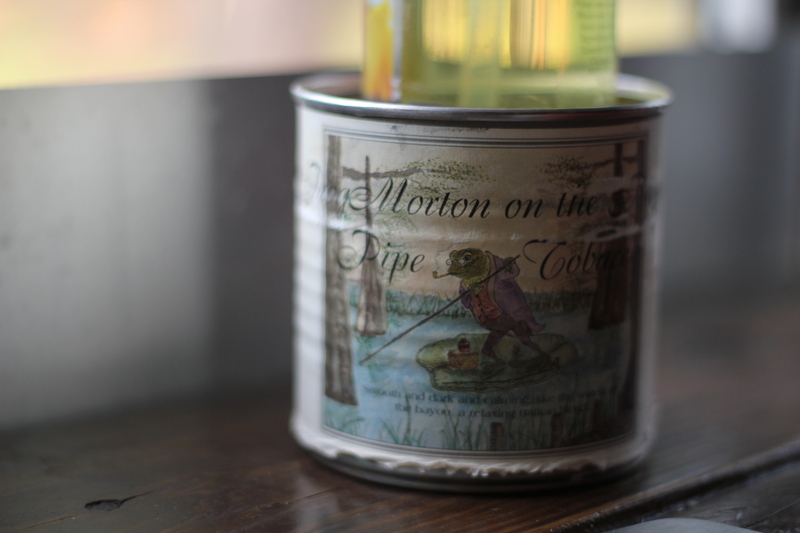 We have separate containers for drinking water. The “faucet” is some copper pipe stuck together. 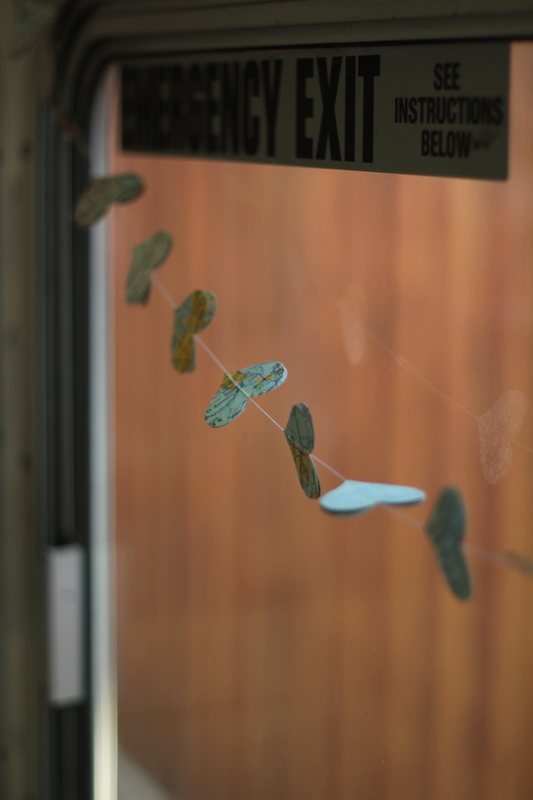 It looks neat but I think we will need to come up with a more permanent solution. 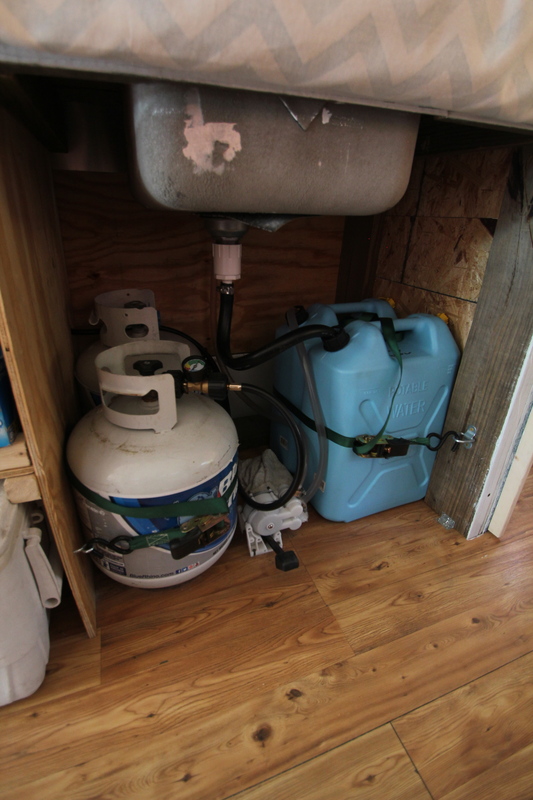 We also store two propane tanks under the sink, with a 10 foot hose running to the stove. 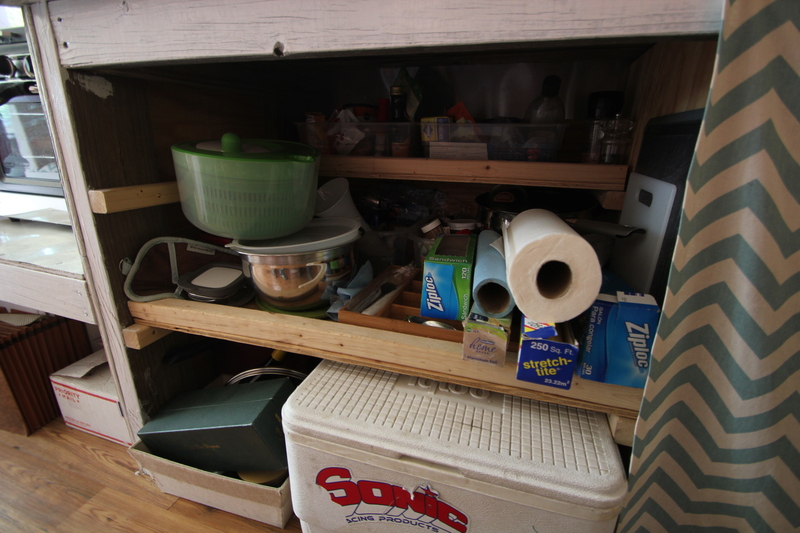 Under the counter there are a couple shelves for food and cookware storage. 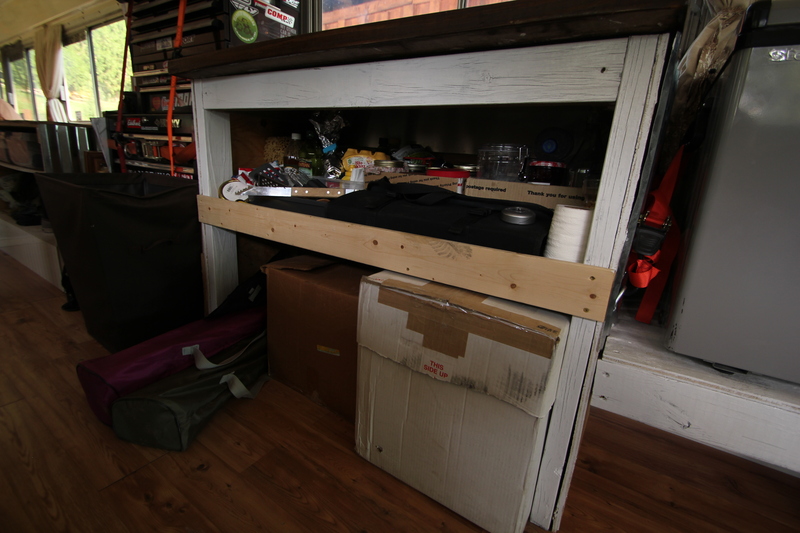 It all works well while traveling, but I am excited to redo this area to be a little more user friendly.We want to be able to open up a more traditional cabinet and have a little more organization for the utensils. 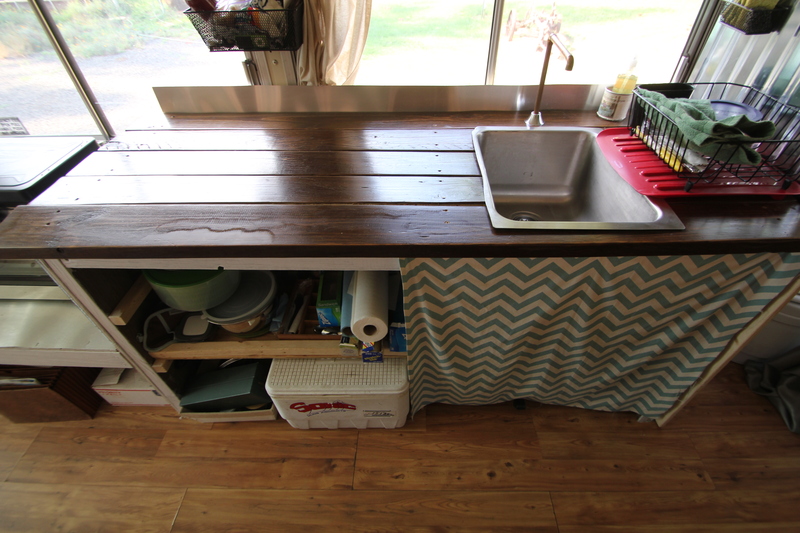 Across the aisle is another counter top and a storage shelf underneath. 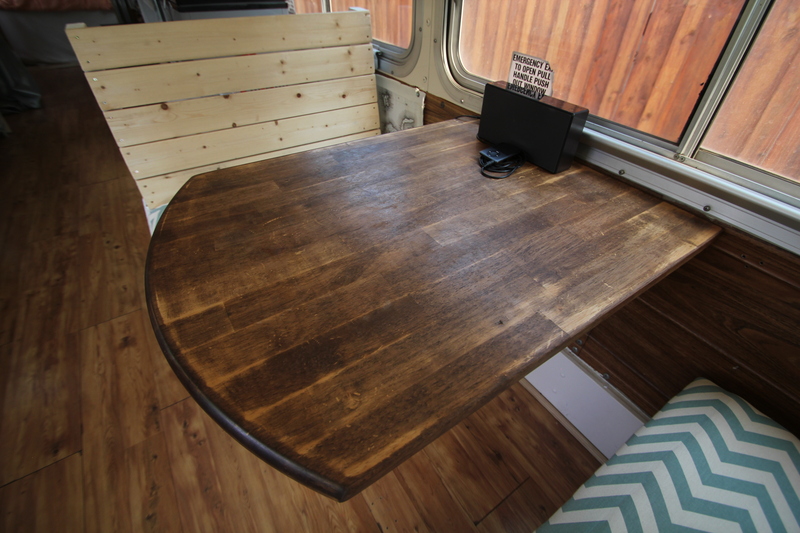 It is really nice to have all the counter space, especially when we start cooking up some bigger meals. Behind the kitchen is the tiny bathroom with our dry-flush toilet. 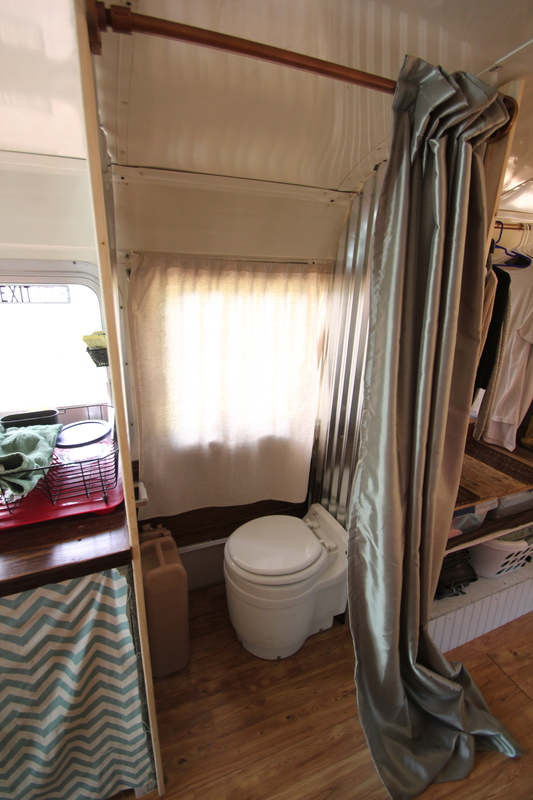 We are still coming up with some different ideas on how to build a bigger bathroom with a shower, there is a lot to learn about tiny home/RV plumbing! Across from the bathroom is my tool box. 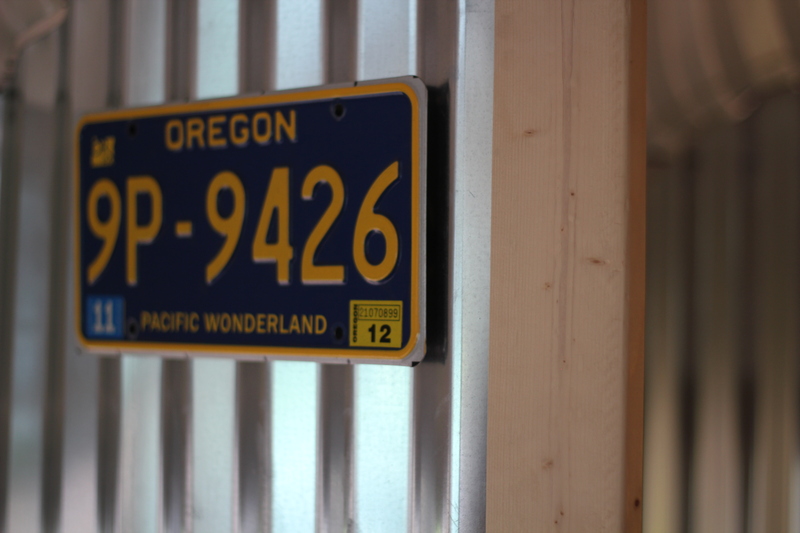 There wasn’t room for it anywhere else so we built it into the interior. 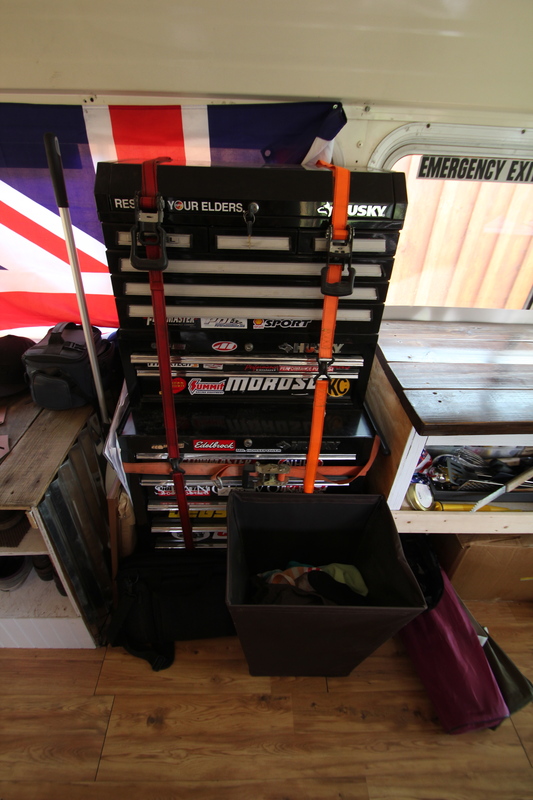 Once we find a place to call home I will move the tool box outside the bus and free up that space for more storage. In the back is the bedroom and closet area. 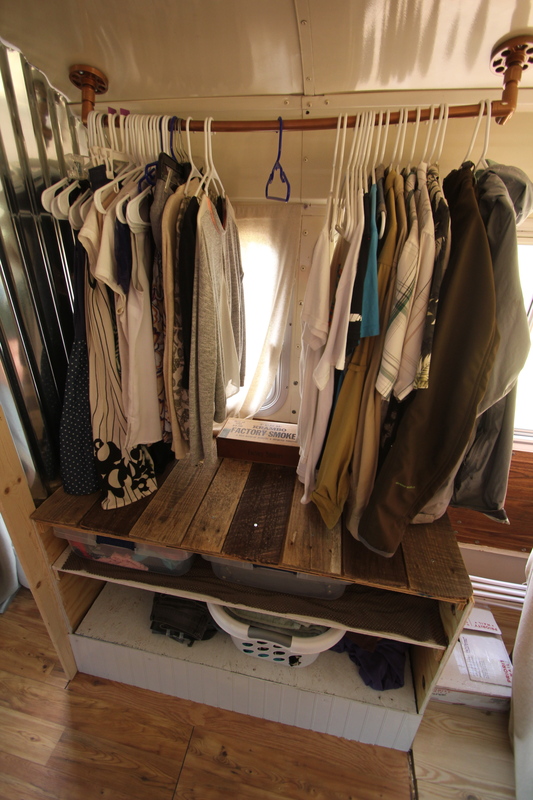 We each have our own clothes storage, built over the rear wheel wells. 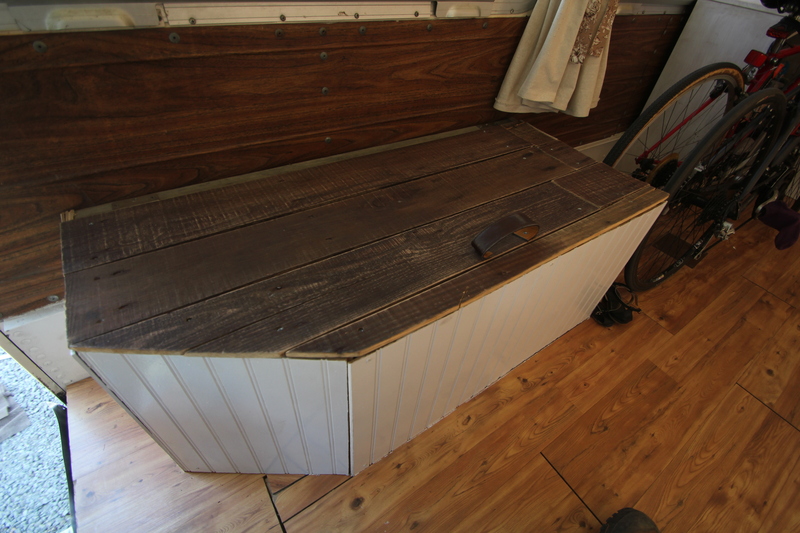 The tops are built out of old pallet boards sanded down and pieced together. The plastic totes hold smaller clothing items, we put down rubber grip mats underneath so they don’t move around while driving. 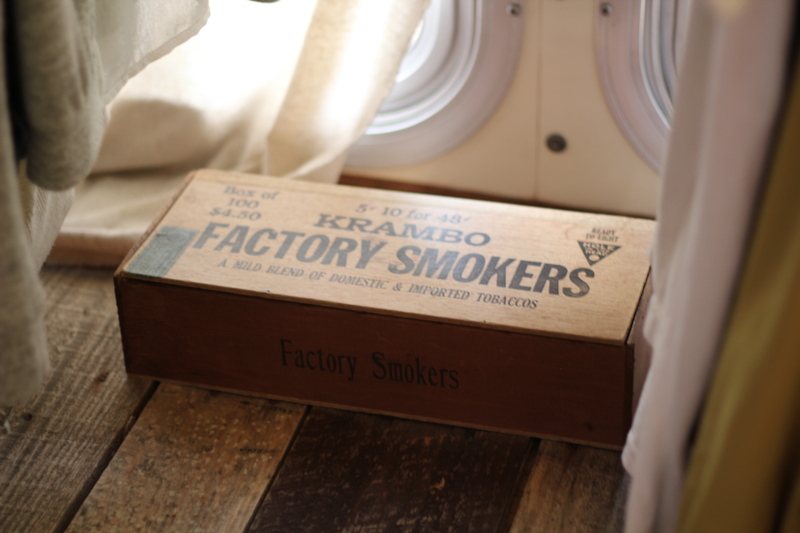 We attached a couple of antique cigar boxes to the tops to hold small personal things. 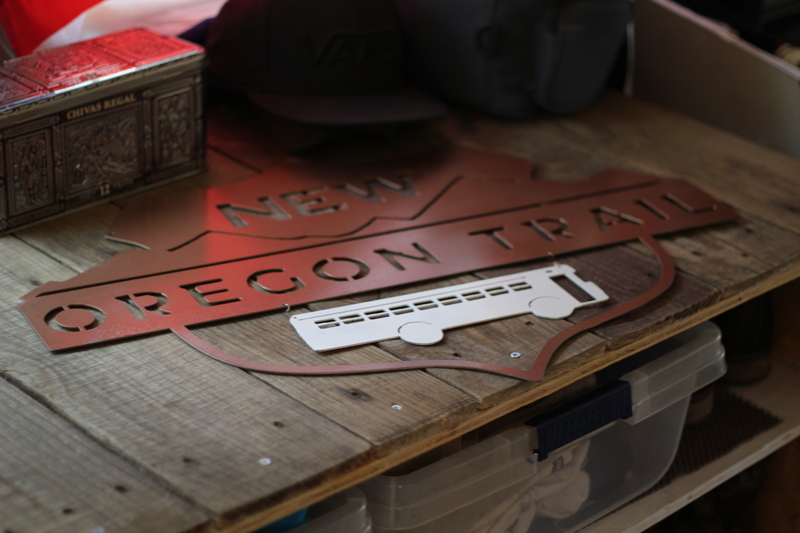 You can also see our New Oregon Trail sign, a handmade gift from our friends in New Hampshire. 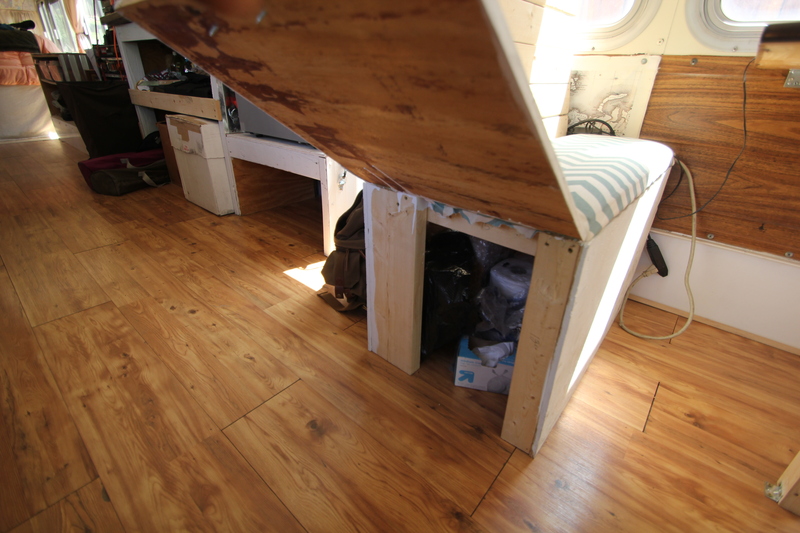 The bed is built up on a tall platform to allow for lots of storage underneath. 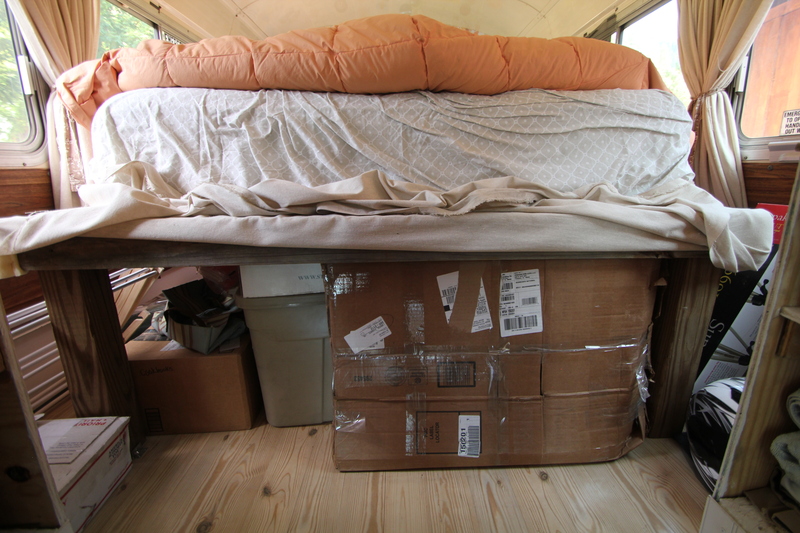 We also have our small inverter/charger under the bed, with heavy cables running through the back wall into the storage compartment where the battery bank is.